Successfully Added 7 Inch Digital Media Player + Ipod Dock to your Shopping Cart. 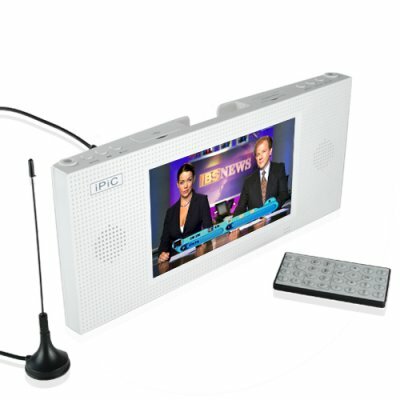 Desktop media player with 7" TFT LCD display. This multimedia player allows you to listen to music, watch videos, enjoy some DVB-T digital TV, view pictures, and has a wonderful alarm + calendar function. Plus you can use it as a IPOD dock for listening to your iPod's music as well as charging it at the same time. Perfect for the office desktop, home nightstand, or the students dorm. This is an amazing little desktop companion. It is both a multimedia player as well as a digital photo frame that fits cleanly on any desktop. Working late at the office? Need a quick break from your homework? Then switch from picture mode to video mode to watch a movie or switch to music mode to listen to your digital music files. Each of these modes also allows viewing/listening from a wide selection of file formats, while the sound output is accomplished from the built in stereo speakers, or you can even use your own headset. This model digital media player has an iPod docking jack for charging your iPod and will also allow music playback. In addition, you can plug in an SD card or USB flash drive and play both music and video files directly from those slots. If all this wasn't enough, this baby also has a DVB-T mode. Available right now from Chinavasion with direct shipping and no M.O.Q (minimum order quantity).